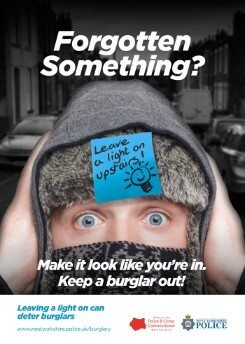 West Yorkshire Police release two main anti-burglary campaigns each year – one in spring/summer and one in autumn/winter. 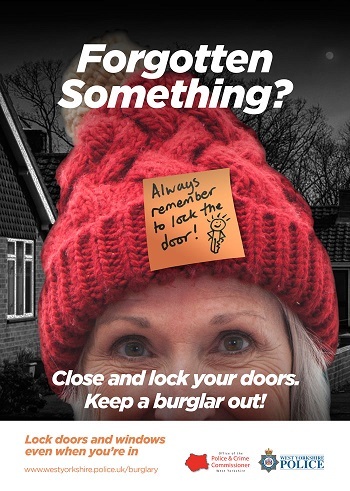 The new autumn/winter campaign for 2017 has just been launched and it’s all about preventing those little lapses of concentration that can enable a burglar to gain access. 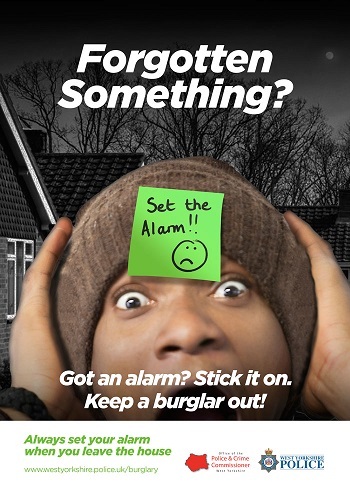 Forgetting to lock your door; not leaving a light on; not bothering to set your burglar alarm: these are all very easy to do, especially when you’re in a rush but it is exactly these minor instances of absent-mindedness that could make the difference between keeping a burglar out and giving them an opportunity. WYP has created a series of posters, using the theme of post-it-note reminders and the slogan “Forgotten Something?” that was used in the summer campaign but adapted for the winter months. The darker nights once the clocks have gone back always bring more burglaries (usually around 20% more) as intruders use the cover of darkness so take heed of WYP’s advice and just take a minute as you leave the house to tick all the boxes of your security checklist (you can download our 6-point security checklist for leaving the house as a visual guide).